I was a participant in a Virtuoso Study Trip in Switzerland. I was very interested in learning more about Switzerland and its countless offerings so I was thrilled to be a part of this incredible Swiss experience. E-biking through the Lavaux wine region which stretches 30 km's along the sunny, south facing northern shores of Lake Geneva would be one of the many, many highlights. Despite the misty, yet warm rain, our group of 14 cycled throughout the lush, terraced vineyards. (UNESCO World Heritage designated). Our wonderfully scenic ride was appropriately capped off with a wine tasting in the very quaint village of Cully, home to the famous Cully Jazz Festival. 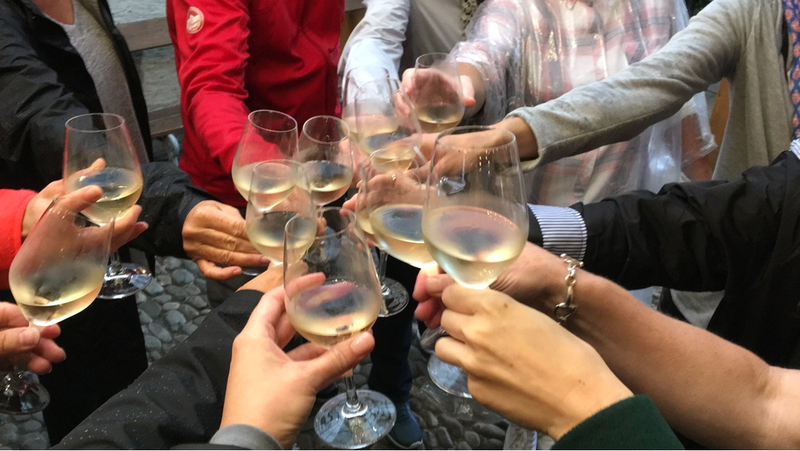 We met with the winemaker and enjoyed a wonderful white wine made from the region's distinctive Chasselas grape: light, crisp, with a hint of salt and minerality - perfect for après cycling. Another highlight was our spectacular 2 hr. 10 min. train ride on the Jungfrau line from Interlaken to Klein Scheidegg; then by cog railway to Jungfraujoch - Top of Europe in the Bernese Alps. It is Europe's highest altitude rail station at 3 354 m. above sea level. 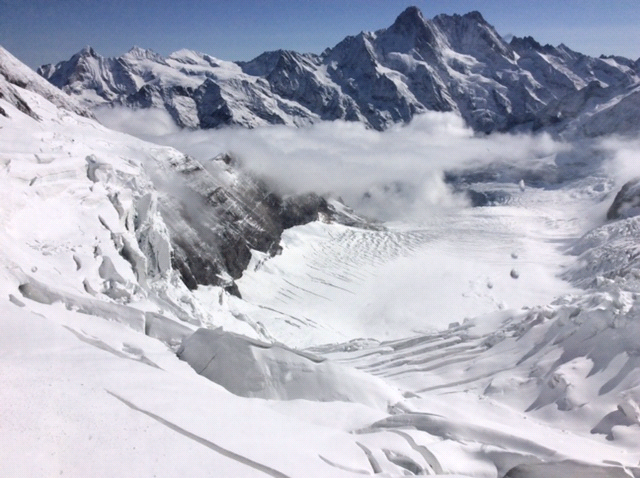 We explored Europe's longest alpine glacier - The Altesch glacier (23 km's long). It was the perfect day to up so high in the Alps and we were blessed with crystal clear and very blue skies. I would have to say one of my most memorable experiences would be our welcoming champagne reception with Kevin Triboulet, Senior Sales Manager at Lausanne Palace, followed by an incredible 5 Course dinner at ‘Lausanne Palaces’, La Table d’Edgard, which holds a Michelin Star. We had returned to the hotel after a rainy and wonderful cycling experience in the Lavaux region. The private dining room overlooking Lake Geneva was impeccably set and fit for royalty. My jet lag was quickly put in the deep background. Our itinerary included 6 nights in 3 cities. We spent two nights at Lausanne Palace in Lausanne. This fine hotel is situated in the heart of the business and shopping district, with exceptional views of the city, Lake Geneva and the Alps. Two nights at the Jungfrau-Victoria Grand Hotel and Spa in Interlaken. The hotel is located between 2 beautiful lakes at the foot of the eternally snow-capped Jungfrau. Finally, two nights at the Hotel Bellevue Palace in Bern. 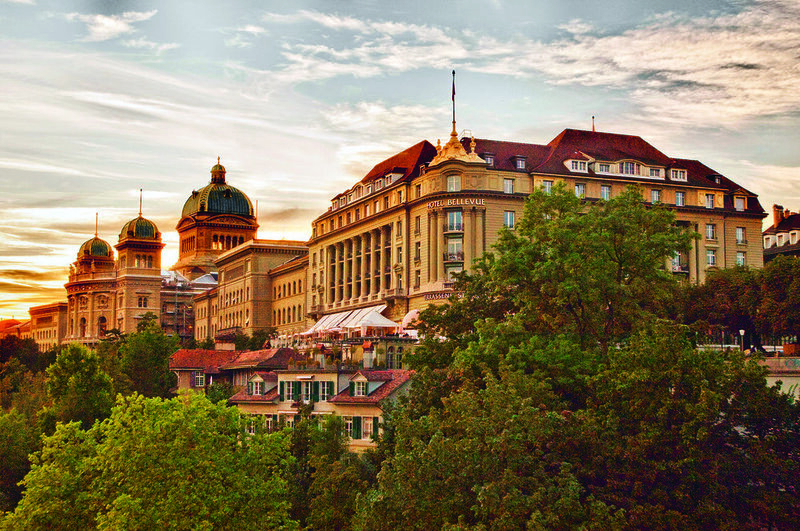 This is the official guesthouse of the Swiss Government and the only grand hotel in the heart of the capital. Gorgeous views of the Aare River and Bernese Alps. We visited Geneva for a day trip to visit the historic and beautiful Beau-Rivage Hotel on Lake Geneva. It was built in 1865 and is set just steps from Lake Geneva. Significant renovations have just been completed and continue to be a very significant and historic hotel in Switzerland. From the Beau-Rivage Hotel we took the very fun e-bike taxis around Lake Geneva to the lovely Restaurant Hotel du Parc Des Eaux-Vives. Our delicious lunch was set in the main dining room surrounded by lush green lawns, gardens and trees. The quaint village of Gstaad was another day trip. We visited the gorgeous Gstaad Palace Hotel and The Alpina Gstaad Hotel. The alpine festival was happening in the village that day so we mingled with the locals and took in the tradition of farmers bringing down their cattle from the Alps to their winter farm residences. The cows were dressed with flowers and bells. The festival, combined with our fondue experience at a local restaurant made Gstaad a greatly enjoyed and truly authentic experience! 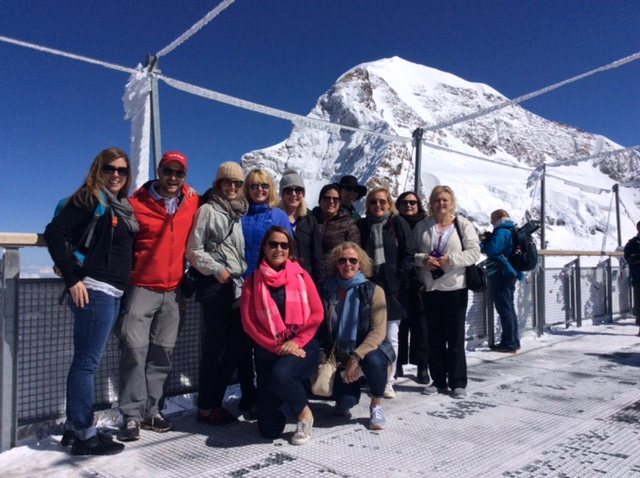 We traveled by train to The Jungfraujoch – Top of Europe. The picturesque train ride up the Alps through the quaint little villages is one photo op after another. At Emmentaler Show Dairy (Emmental Region) we had a tour of cheese making. We helped stir the cheese and then pour into the molds. Of course this was followed by a delicious cheese fondue lunch at their beautiful on-site restaurant. Walking tour of the old city of Bern which is a UNESCO Cultural World Heritage Site (1983) is something you must see. In Einstein Museum tour we learned that Einstein became a Swiss citizen in 1901 while working at the Swiss Patent office. The famous clocktower, known as the Zytgogge, in the old city of Bern inspired Einstein’s first thought experiment. This experiment set Einstein on the path towards his Theory of Relativity. The three wonderful hotels we stayed in, along with our day trips most definitely encompassed all that Switzerland has to offer. What surprised me the most was how good Swiss wine really is. I had always been told that the Swiss make excellent wine but they consume it themselves with very little exporting. Their limited amount of wine lands keeps their production to small batches. It was such a pleasure to be treated to our wonderful wine tastings and to happily learn for myself they truly do produce excellent wine! Speak to your Away Travel Advisor to book your own Switzerland getaway today, or contact us via email below. Older PostThe Inside Scoop: Japan - "Land of the rising sun"